Moments like these make me wonder what they are planning. What sort of mischief they are discussing. 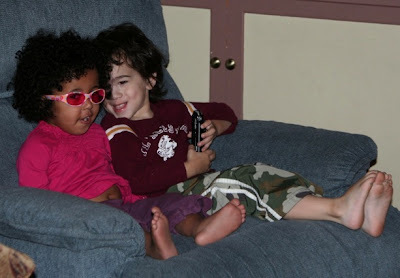 Seamus is 17 months older than Marlie, but gender differences and the fact that girls mature emotionally faster than boys.... makes them just about twins. And so I call them the Wonder Twins. They love to run around together, wreaking havoc. If they are out of my line of vision and they are quiet, I know they are up to something. She has nearly caught up to him with her verbal skills which just blows my mind. And they have these little conversations top secret-diabolical planning sessions. If we are out driving around or in a store and she spots something pirate themed, she yells for Seamus, so she can point it out to him. If he spots something mermaid themed, he yells for her. 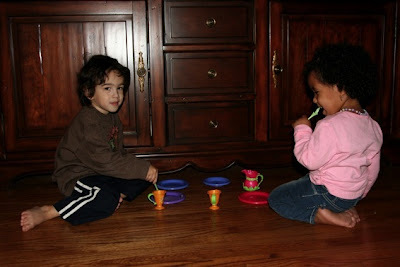 She will play “pirates” with him, and he will play “dolls” or “tea” with her. Of course when they play “tea”, his tea cup contains rum. In the car, their carseats are next to each other. They are either holding hands contently or poking/hitting one another. At home, they hop on their ride-on toys and zip around the house together. So much is changed since Seamus hit the terrible two’s when/because we brought Marlie home. Now he’s the first one to tell her “I love you and night-night” when she’s headed off to bed. I wonder how their adoption status will play out as they grow up together. Will they be especially close, having the bond of both being adopted into the same crazy family? Will there be mixed feelings that Seamus has the option of hiding his adopted status while Marlie can not? These are questions that can only be answered in time. I look forward to watching these two grow up. They give me headaches at times but they give me so much joy. I’m very lucky to be their Mama. And this is why I should never blog after watching a sappy love story movie with my hubby. Mushy-introspective blogging makes me very uncomfortable. Maybe it’s the croup and flu that we have been battling in the family. I must be delirious with fever. I will rest now. I’ll get better and promise never, ever to be deep, introspective or mushy again.